Wisma Nusantara Building was the historical building, built in the most strategic location in the City of Jakarta. It started to be built in 1963, unfortunately stopped in 1965 due to political circumstances and was then continued again in 1969. At that time, the Wisma Nusantara Building was a prestigious project in Indonesia. Wisma Nusantara was said as the first and highest skyscraper in Indonesia and South East Asia. It was the first generation of high-rise building in Indonesia and also the first earthquake-proof building prototype of second generation of high-rise building in Japan. The construction was using high quality steel which directly imported from Japan. Mitsui & Co, Ltd was the main contractor. Wisma Nusantara used caisson foundation to stabilise building when earthquake happens. Caisson Foundation is still applied on most water buildings such as bridges and ports which must resist from water or wind shake. 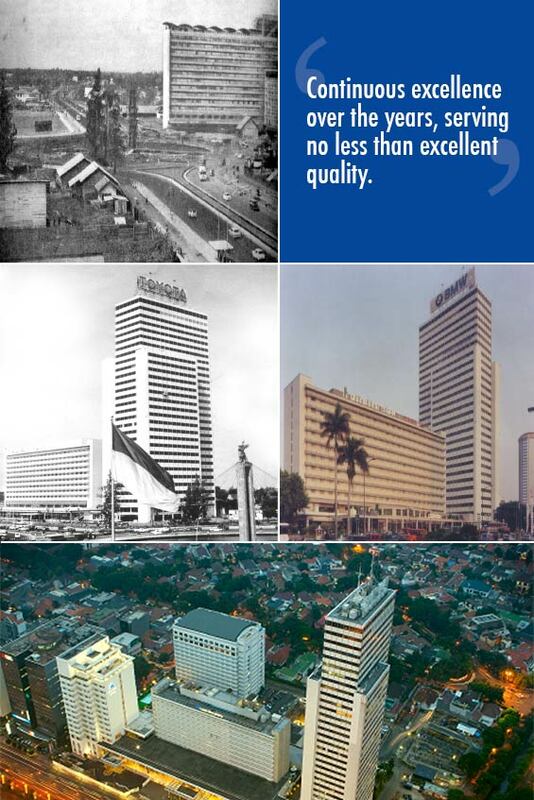 Wisma Nusantara was officially inaugurated on December 2, 1972 by President Soeharto. PT. Wisma Nusantara International shares was firstly held by Mitsui 55% and Indonesian Government 45%. After that year, many developments were continuously being done. First Project Renovations were first done in 1990 which consist of JICA building constructions. The Connecting Bridge between Wisma Nusantara and Hotel Nikko was built in 2002 to improve the look of building facade and build a secure and convenient access between Wisma Nusantara and Hotel Nikko. In 2005, the Annex Building was established to accommodate parking for Wisma Nusantara and Hotel Nikko guests and tenants. More improvement of interior renovations were built such as elevator lobby, toilets and pantry renovations, elevators modernisation, security and Fire alarm system including additional CCTV, Xray and new semi addressable detector. Never being content, we keep striving to give better qualities to our client by keeping on improving. We have just completed some other developments such as redesigning and rearranging open parking area, landscaping and new look of entrance and exit gates. Some improvements are made in accordance with government regulation,such as smoking room is provided on 2nd and 23rd Floor to facilitate smokers. We also do concern about environmental issues. We have built water absorption capacity 312 m3 and 400 m3. We also planted Trembesi Trees (Samanea Saman), that is said to have better ability in absorbing CO2 compared to other trees, as suggested by the government. We have built a water recycle plants to solve water shortages. The plants were also to support government policy of not using deep well. Our water recycle has capacity of 400 m3 clean water which is used for toilet flushing, Cooling Tower, and Plantation water. Energy Saving has now become to our most priority concern. This is to move forward to green building. We are trying to optimise energy usage. Some programs are now being done, such as replacing lamps and water tap with energy saving type ones. Those improvements will bring benefits to all of us, however, we also need the support from all tenants in order to make it a success.